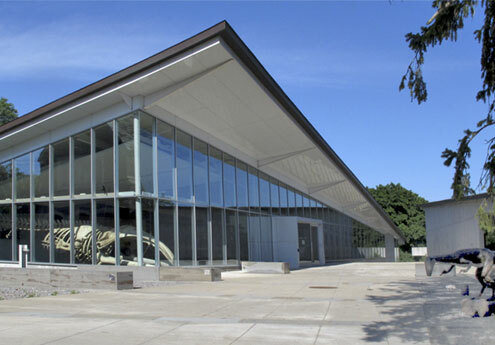 Museum of the Earth Paleontological Research Institution « Jeff Kennedy Associates, Inc. The internationally known natural history collections of the venerable Paleontological Research Institution are at the heart of the Museum of the Earth, a major attraction of New York’s Finger Lakes region. The 7,500 square foot exhibition tells the story of the history of life on Earth, focusing particularly on three remarkably different worlds that once existed in what is now New York State. We had the opportunity to work closely with the architectural firm of Weiss/Manfredi as they developed their award-winning building design. As exhibition designers, we were especially interested in preserving collections by minimizing UV from daylight. While the main entry is brightly daylit, visitors follow a ramp down into exhibition galleries that are embedded in the hillside with minimal fenestration. 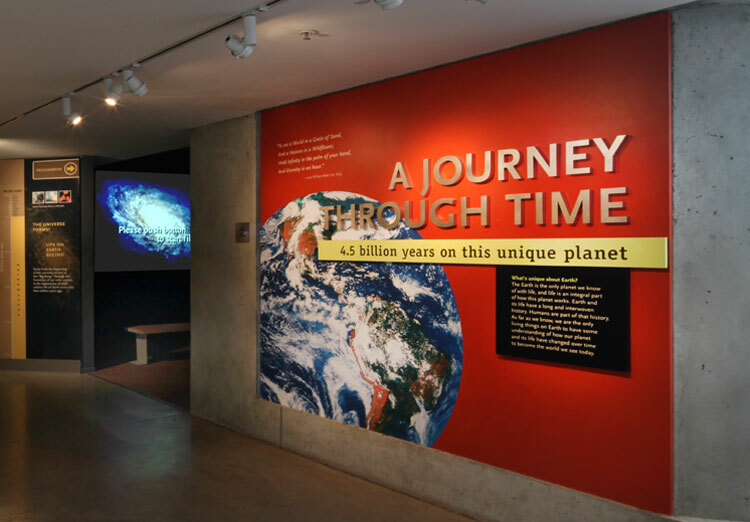 The museum storyline focuses on the interdependence of the physical Earth and life on our planet over its 4.5 billion year history. The journey through time is brought to life through artifact displays, object theaters, hands-on science labs and powerful works of art. 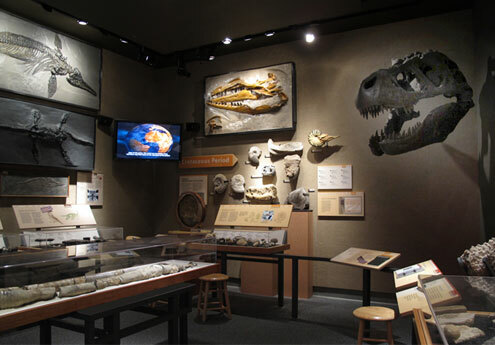 Immersive settings and extensive fossil displays provide a backdrop for three focal time periods interpreted in the museum. Life in an Ancient Sea (Devonian period, above), looks at Ithaca when it was covered by the warm waters of a shallow sea. The skull of a Dunkeleosteus highlights an area bounded by a display of marine invertebrates from the world class fossil collection of the Paleontological Research Institution. Two other windows into life in the region long ago, The Age of Dinosaurs in the Northeast (late Triassic to early Jurassic period) and A World Carved by Ice (Quaternary period), are featured. In addition to the museum’s three focal time periods, life-changing bio-geo events during interstitial periods are interpreted in three artifact-rich mini theaters. Fossil displays, lighting effects and videos animating illustrations commissioned for the exhibition by noted natural history muralist Doug Henderson, combine to dramatize a constantly changing planet. 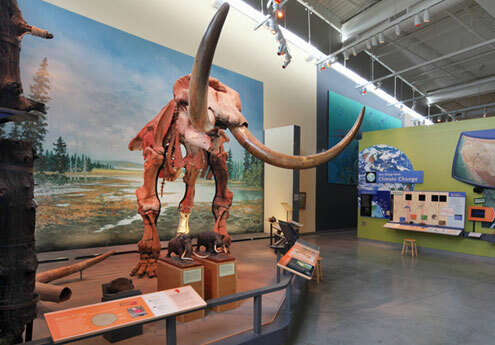 The Hyde Park Mastodon, discovered nearby in 1999, was excavated by PRI staff and prepared as the anchor piece for the museum’s Quaternary period vignette. Set in the context of one of Doug Henderson’s commissioned murals, its imposing skeleton—one of the most complete specimens of its kind ever found—helps visitors imagine what Ithaca was like during the Ice Age. 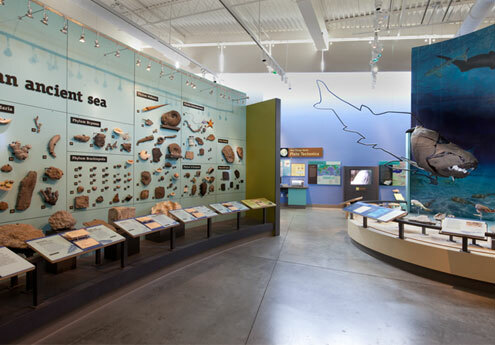 A facilitated, hands-on lab area is embedded in each of the three focal time periods around which the museum is organized. 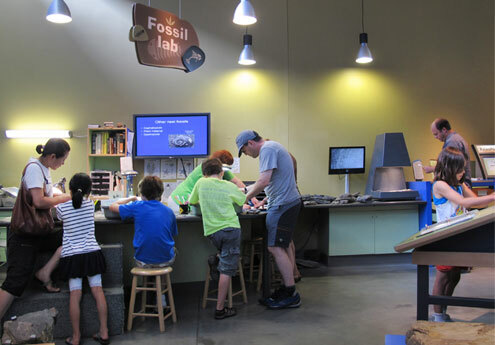 This one, the Devonian period’s Fossil Lab, is extremely popular with local residents who can bring in finds from their fossil-rich environs and use lab resources to identify their specimens. Staff expertise abounds and enriches visitors’ experiences in the lab.